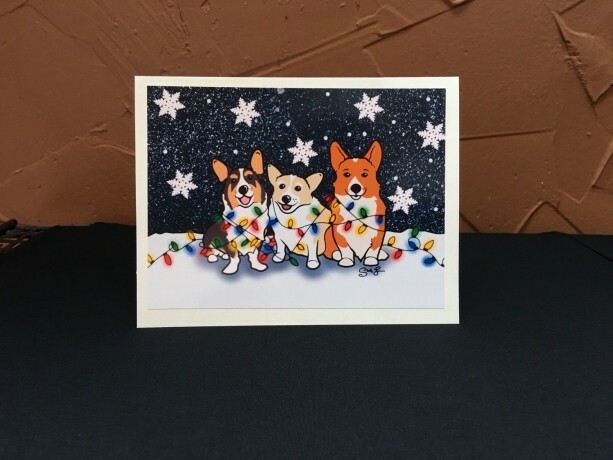 Send someone this fun handmade greeting card designed by The Cloudy Corgi! 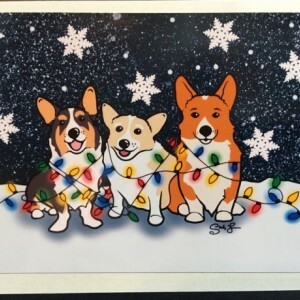 ———————————————————————————— This card features three welsh corgis attempting to put up Christmas Lights. You can see how well that is going for them! Never let corgis put up your Christmas lights, unless you want them only a foot off the floor! 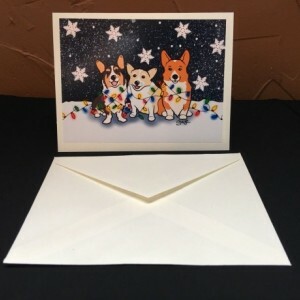 The inside of this card is blank so you can write your personalized message. It is also great for many occasions! The image on the card was digitally drawn, then printed on a glossy photo paper. Next the image was hand cut and adhered to ivory colored card stock. The measurements of this card are 5” x 6.5”. The card comes with a matching ivory envelope and they are sealed together in a protective plastic sleeve. 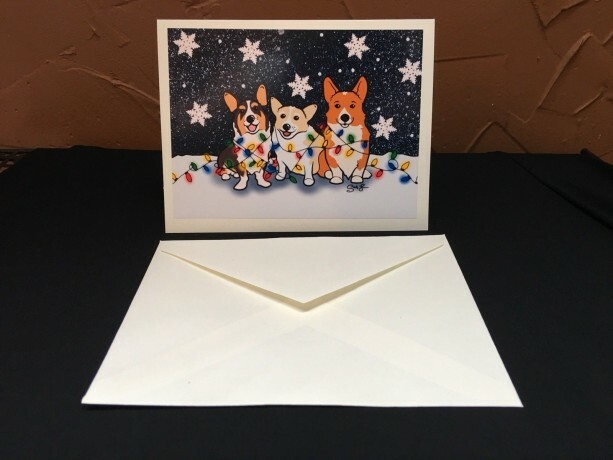 Need a large quantity of cards? Please send me a message I would love to do a custom order for you! ———————————————————————————— *Policies* Returns and exchanges: Due to the nature of these products I do not accept returns or exchanges; however, if you receive a damaged product please let me know and I will quickly send you a new one. Shipping: Every item comes with free shipping to the USA. And every order includes a little extra gift ;) *Will ship internationally but there will be no tracking. (Large 1st class envelope) Processing Times: I try my best to send packages out with same day shipping, if I can’t get it the same day it will be a 1-2 day processing time. ———————————————————————————— *I want to say thank you for supporting my small business. This is my passion project and I love creating and sharing my art! Every item in my store is handmade by me and I strive to produce beautiful and unique products. Your purchase helps support my dream! Please favorite my store or check back for more! I am constantly creating. 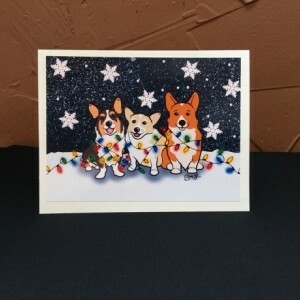 Although the store has many corgi products I plan on expanding to a variety of breeds as well as other animals. Also if you have a suggestion for a design please send me a message. I would love to create a design for you! 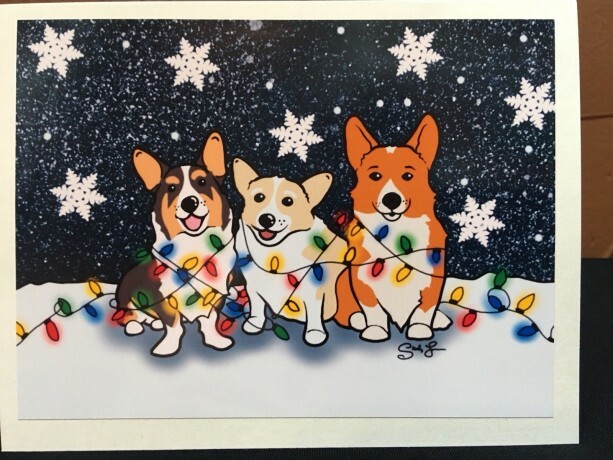 Thank you for shopping at The Cloudy Corgi! ———————————————————————————— Like my Facebook page: The Cloudy Corgi / Instagram: thecloudycorgi for more info, works in progress and the shenanigans of my 4 corgis!